In fact, the students were pretty chatty, even as Gustavo Dudamel, in all-black, walked on stage with Joshua Bell, in his grey-blue T-shirt, dark skinny jeans and red athletic shoes. The orchestra was tuned and ready, and without ceremony they began the piece. As Bell entered over the hushed static of the orchestra -- his 1713 Gibson Strad so clear, so pure -- the talking ceased, audience fully arrested by the music. 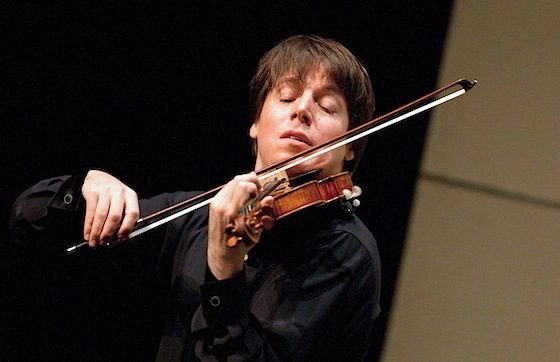 How does Joshua Bell do that? In fact, I was mesmerized enough by Bell's playing that I completely forgot the presence of Gustavo Dudamel on the podium (how is that possible?) until the first big orchestral tutti, when I noticed the spirited forces of the LA Phil. Clearly the members of this orchestra play with extra energy under the leadership of their still-beloved-after-five-seasons Music Director, Dudamel. The stage seemed to hold two forceful musical magnets -- not competing ones, but symbiotic ones that knew just when and where to direct their powers. Bell's playing somehow creates an attentional stillness in his listeners, whether the music calls for sustained force, sparkly bariolage, singing melody or a whirl of notes all in one gesture. Dudamel chorals the orchestral forces with elegance and economy, whether the orchestra is dropping into the background for the soloist or painting a lush picture itself. Bell, one must remember, is also a conductor (of the Academy of St. Martin in the Fields), and after the first movement he and Dudamel leafed through the score to nail down a few details toward the end. To me it had a nice, fast clip and captured the careening, unhinged feeling of that movement as it plays out. Yet for all the amorphous rhythm and misdirection that Sibelius built into the end of the first movement, it was particularly clear in the rehearsal setting that Bell knows precisely where everything gets placed. The second movement opens with a great woodwind moment (and the LA Phil has a great woodwind section), a musical blooming in the brass, then the violin. I immediately felt the first entrance to be simple and unsentimental, yet as I was writing down "unsentimental" I was flooded with nostalgia, suddenly remembering being in Bloomington, Indiana in 1990, hearing Bell perform a recital at the Indiana University, wondering where so many years went, feeling grateful that this artist has done nothing but persist and grow in his art. Deep in this movement, the spirit of winter truly arrives, as the orchestra sweeps in like a storm, then leaves the violin stranded, in a morass of syncopated double stops. The last movement scampers and gallops, with wild octaves whizzing up and down. By the end, Bell looked like he'd been at the gym, rather than the concert hall! And yes, he moved a lot. I'll tell you why it doesn't bother me: he moves, but his tone is unwavering; his sound is "sound." 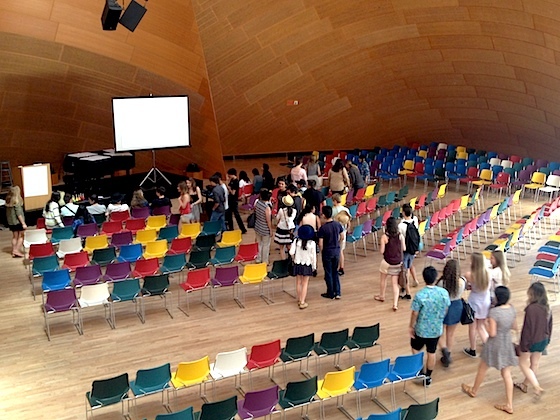 After the rehearsal, the students were shown to the lecture hall for a workshop on the Sibelius Concerto, run by LA Phil Teaching Artist Chelsea Howell. On the screen was a quote from Jean Sibelius's wife, Aino, who reveals how inspired the composer was while writing the violin concerto: "He has such a multitude of themes in his head that he has been literally quite dizzy. He stays awake all night, plays incredibly beautifully, cannot tear himself away from the delightful melodies - he has so many ideas that it is hard to believe it. And all the themes are so capable of development, full of life." Howell explained that Sibelius "was a very good violinist, and I think that informed his concerto." In fact, Sibelius had dreamed of becoming a virtuoso, but simply never made it to that level of playing. She also spoke about Sibelius's role in helping Finland, then under the rule of Russia, to celebrate its own culture and find its national identity, particularly with works such as "Finlandia." When Howell asked what season the Violin Concerto evoked, a majority of the students said, "Spring!" At first I was puzzled, then I remembered that these students are all Southern Californians -- likely few of them have ever seen snow, lived through a full winter, or even experienced temperatures below freezing. They might sense the darkness of the music, the stillness -- they might get the feeling of a barren landscape. But why would this concerto make them think of winter? Howell noted that the concerto had a rough premiere, with a bad performance by Victor Novácek and a terrible review by critic Carl Flodin. He later revised the work, shortening it, taking out a cadenza, and changing the end of the second movement. Though violinists typically play the revised version, Sibelius's wife liked the original better, and in recent years, the original has been performed and recorded, most notably by Leonidas Kavakos. Howell also said that the Sibelius Concerto is the most-recorded concerto of the 21st century -- who knew? Though Sibelius lived to be 91, he composed nothing after the age of 60. In fact, he burned many of his later compositions. Very fresh written so it is interesting to read.